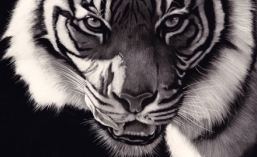 Update to the new International Society of Scratchboard Artists. Our board which includes me as Vice President and six others from the USA and Canada is well underway with incorporation and organizing a show for next year which will be held in Austin, Texas which will include some of the finest scratchboard art in the world. The International Society of Scratchboard Artists came about initially because we had noticed on many occasions artists commenting that the exhibitions they were entering work into had no category for our medium. When people asked organizers which category they should enter their scratchboards into, they would be told such things as ‘Works on Paper’ or ‘Drawing’. Sometimes we would be put in a ‘Multimedia’ category and some organizers have dared to tell us scratchboard might be better suited at craft shows without ever seeing our work or what scratchboard as a medium is capable of in the hands of good artists. 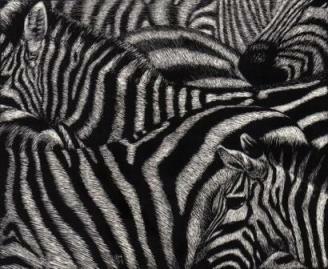 Many members of the general public and artist communities alike have little knowledge of scratchboard. We know it is a fine art medium and our desire to elevate it to that level in other people’s consciousnesses is one of the driving forces behind the formation of ISSA. Other mediums have their own societies representing them but we never did, until now. We spent a lot of time bemoaning the fact that scratchboard as a fine art medium didn’t get the recognition it deserved. This will change with ISSA which has the goals of lifting the profile of scratchboard internationally, providing exhibitions for members to enter their art into, organizing workshops to get the message and teaching across to the art and general communities and providing an organization where scratchboard artists can feel like they aren’t isolated but can actually feel a sense of belonging to what is already a very large community worldwide. Even without a society we already had members winning “best in show” and “people’s choice” awards and making great sales in some of the most prestigious art exhibitions in the world so with a society the future of scratchboard looks very bright indeed. The founding board members of ISSA are Lorna Hannett from Canada, Sue Rhodes, Diana Lee, Cathy Sheeter, Sandra Willard and Ken MacFarlane from the US and Patrick Hedges from Australia. So, if you are a scratchboard artist, or would like to try this medium, watch this space over the next few months. Patrick; I can’t wait! As soon as you have decided on the dues, let me know! I want to be one of the initial members. So looking forward to being involved in the ISSA. Mmmm. Think I just might be joining this one!!!!! Can’t wait. Yay for scratchboard art. Bully for you all! What a task to take on, your goals and reasons are laudable. Laud! Great. Thank you for your efforts. Look forward to your updates. Very well written Patrick! Being another who loves scratchart I will also look forward to becoming a member of ISSA. Very well put! Thank you for putting us all out there. I thank you and the world of scratchboard artists thanks you!